Not sure what it takes to become a registered dietitian nutritionist? I share my journey and the steps I took to become a credentialed nutrition expert. I began this blog to not only discuss nutrition, travel, and health, but to document my journey to become a Registered Dietitian Nutritionist (RDN). My path to become a RDN was very long-I’ve definitely taken the scenic route. I did not go to university straight from high school, but rather started working (and traveling). I had always known that I wanted to go back to school to study nutrition, but I was afraid of the time commitment and, to be honest, the science courses. I decided to return to school when I was 26, after I married and moved to California from the Midwest. At first I took only a few classes at a time at a local community college, to ease myself back into being a full time student, and then became more serious as I realized that putting time and effort in my classes could yield good grades (who knew?!?). After receiving my Associate in Science, I transferred to university to finish my degree in dietetics and completed an 11 month supervised practice internship, and then sat for the RD exam. Writing that short sentence is summing up what has been the most intensely stressful–yet hugely gratifying–four years of my life thus far. Before I begin talking about my experiences and tips for the hundreds of nutrition students still working on their degrees, first let’s take a look at what being a RDN is all about. Registered Dietitian Nutritionists (RDNs) are nutrition experts and are the only legally recognized nutrition professional in the United States. RDNs work in a variety of settings including (but not limited to) hospitals, clinics, public health, business, private practice, sports, universities, and research. Having a career as a dietitian has consistently been named one of the best (and least stressful, though I’m sure many RDNs would disagree) jobs in the country. As society becomes increasingly aware of the importance of nutrition in health outcomes, the need for RDNs grows. In fact, the demand for dietitians is expected to grow faster than average, at 21% in the next ten years. What is the difference between a RDN* and a nutritionist? RDNs must have a minimum of a bachelor’s degree, complete specific nutrition courses, finish a minimum 1200 hour supervised practice program, and pass a rigorous registration examination before they are allowed to use the title “Registered Dietitian Nutritionist”. RDNs are bound to professional and ethical standards and base their decisions on evidence based practice. Registered Dietitian Nutritionist are the gold standard in nutrition care in the United States and beyond. All dietitians are nutritionists, but not all nutritionists are dietitians. Anyone can call themselves a nutritionist, with or without nutrition education or certification. In fact, there are many “nutritionist certifications” online that can be done in less than one day. 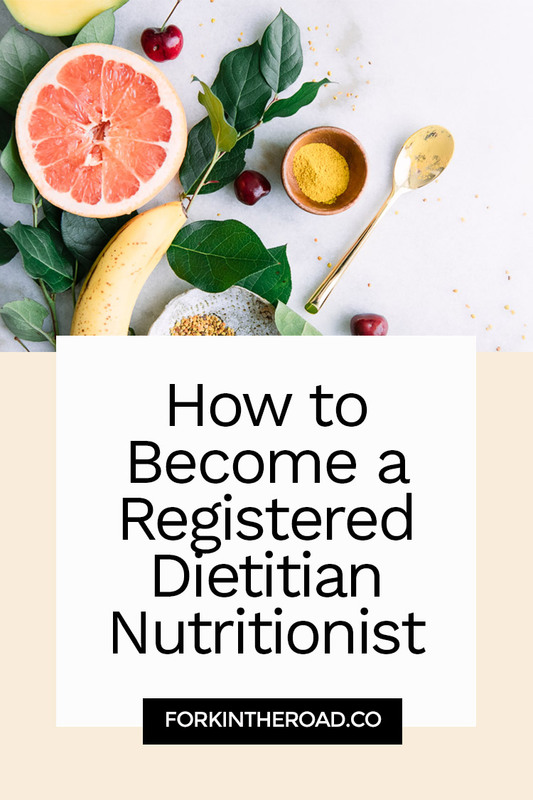 *The titles “Registered Dietitian” and “Registered Dietitian Nutritionist” are interchangeable and each dietitian can choose to use whichever credential they prefer. Complete a minimum of a bachelor’s degree and all required nutrition courses through a program accredited by the Accreditation Council for Education in Nutrition and Dietetics (ACEND®). Complete an accredited supervised practice program (commonly called the dietetics internship), usually lasting from 6-12 months. Pass a national registration exam. Complete continuing education requirements to maintain registration throughout your career. There are different routes to finishing the educational requirement before becoming a RDN. Complete a coordinated program, in which the bachelor’s/masters degree is combined with the supervised practice. Because of the highly competitive nature of acceptance to dietetics internships, this is the easiest route to becoming an RDN because you are guaranteed acceptance into the supervised practice. However, being accepted into the program may be more competitive than doing the internship separate from the degree and there are far fewer coordinate programs (all are listed here). As always, thoroughly research all programs before applying. Complete a bachelor’s or master’s degree in nutrition/dietetics that is separate from the internship, called a “Didactic Program in Dietetics” or DPD. Accredited DPD programs can be found here. If you already have your bachelor’s degree, you may either complete another bachelor’s degree or do an accredited master’s degree program. Then apply and complete a supervised practice program; a list of internship programs is found here. What’s the Deal with the Internship? If you are lucky enough to do a coordinated program, then you will not have to experience the dietetic internship application process. I, like the majority of dietetics students, went the DPD program route and had the pleasure (ahem) of applying for internships in my senior year. The internship application process is intense–students apply through a centralized application portal and are matched to one program, or none. Each applicant finds out their match at the same time, available to view on the application portal, and words cannot explain the excitement and nervousness among dietetics students on that day. The match rate is currently at 47%, which means that over half of those who apply are not matched to a program and must wait until the next matching round to apply again, usually in six months to one year. There are many rules, tips, and tricks to applying for and being matched to a dietetics internship, but the most important is to bring the best possible application to the table. A high GPA, excellent work/volunteer experiences, and leadership can be what makes or breaks an application. See my post The Lowdown on Dietetic Internship Applications for my advice for making sure you match to your top program on Match Day! My advice to those considering studying to become a RDN? Research, research, research! I cannot count the hours I spent searching for information about becoming a dietitian over the last six years, they would measure in the thousands. I researched schools, internships, read blogs, reached out to current students and RDNs, and never hesitated to ask questions. I went after every experience I could get my hands on to make sure that becoming a RDN was really for me. I suggest starting with the resources listed below and going from there. The profession is always growing and dietitians are more than helpful with information for students, because they know what it’s like to be in your shoes! All Access Internships: Hands-down the best resource for dietetics students. Check out director Jenny Westerkamp, RD on Youtube for more information about internships. Nutrition Jobs: A site devoted to careers for nutrition professionals. There is also a great blog featuring different students and RDNs. See my feature here! Dietitian Central: A website for RDNs posting jobs, articles, and career advice. The forums are the place to post and search information and get answers from nutrition professionals and fellow students. Reddit Dietetics: A gathering of students and RDNs on Reddit that post about issues pertaining to the profession. Posting here will give lots of great insight into what it takes to succeed as a dietetic student. Blogs: With more people searching online for information about nutrition and health, it’s no wonder that so many RDNs and students are now online! Try the Nutrition Blog Network for a list of RDNs that blog or a simple search to show blogs written by dietetics students. I hope this answered any questions about what a RDN does and how to become a dietitian, keep an eye out for future posts on my resources for RDNs section. If you have any further questions, don’t hesitate to leave a comment or contact me anytime. Of course, thank you for stopping by and saying hello! I love sharing the details of how to become a dietitian, it’s a long road but worth it. May I ask… you mentioned you were held back to starting this degree due to the science classes. I too am anxious about starting for this reason. Did you find them as difficult as you thought they would be? Thank you for sharing your experience! Hi there, thanks for reaching out! Yes, I was nervous about the science courses but once I dug in and started the work, I actually really enjoyed them and ended up doing really well. In high school I was never interested in science, but since I knew that nutrition and health was what I wanted to pursue, science took on a new meaning to me. I was able to see science in action and not just as an abstract subject I needed to get through to graduate. That’s not to say that the courses were easy–they were not–but I was much more dedicated and for that reason I ended up doing well. Good luck, it’s a long road to become a RDN but it’s worth it! Hi, Kristin! I graduated in 2004 with a BS in broadcast journalism. After many unfulfilling jobs sitting in a cubicle all day, I’ve decided that I’d like to pursue a career in dietetics and nutrition. I realize that I’ll have to start by taking many science classes. My question for you is, once those are complete, am I able to apply for a master’s program? Or will it depend on my transcripts? Hi there! Each program is different, but once you take the necessary prerequisites for the dietetics master’s program you will be able to apply. However, the prerequisites may include more than just the science classes. You’ll likely need to take the general sciences (biology, chemistry, organic chem, anatomy, physiology, etc.) and then will likely also need to take some general nutrition classes and psychology. However, first I would pinpoint the potential master’s programs you’d like to apply to and then chat with their admissions programs to see what exactly they need. Some may want to you to take all prereqs before applying, while others may only need you to take a few and will allow you to also take some while taking your nutrition courses. It’s a long road to become a RD, but it’s definitely worth it! I would also recommend getting some type of experience through volunteer work or something similar. Good luck! This is such a fantastic article! I am in the process of applying for MS in Nutrition DPD programs, but am actually coming from a totally unrelated background. I’ve been taking many pre-reqs and getting all of my recommendations lined up from undergrad and professional, but I need some better volunteer experience in basically any related field to be more competitive. Would you have any recommendations for types of volunteer opportunities to look for? Thanks! Thanks so much! Great job on getting your coursework and recommendations in line, that’s the hardest part. I would say the best volunteer experiences are those that align with your future goals and things that you love doing. But I will say that many DI directors do value clinical experience of any kind, because it shows you have experience in a hospital or clinical setting. But otherwise do what you enjoy doing to get experience and don’t overwork yourself! Grades definitely come first. Good luck! Truly grateful I found your page. I can’t count the number of times I’ve searched online for a ‘straight-to-the-point” article on How to become a RDN. Thank you for providing that here! I want to ask, specifically on experience, for someone with a different background would you suggest earning experience through volunteer work while employed in another field or stepping away from the unrelated field to nutrition in terms of employment? Unfortunately most paid-positions require some experience in nutrition, thus makes it a bit more difficult for an entry-level candidate. Hi there, thanks so much for commenting and I’m happy you found this article helpful. I wrote it because I myself could not find a to-the-point outline of how to become a dietitian. As far as getting experience, I think you could do a little of both. There’s value in the fact that you have a job and have experience in another field–a lot of students come into dietetics right out of high school and without work experience, so this is a plus. I think you can get nutrition-specific experience in many ways, including leadership in your school’s clubs, volunteering one night a week in a hospital or food bank, etc. If you’re not yet in the dietetic program, I wouldn’t worry too much about experience yet. Just get those prerequisite classes done, get into the dietetics program, and then find a volunteer experience. Work the job in another field to get the bill paid (I worked in restaurants while in school, which actually provided great food service management experience). Good luck! Hi Oluchi, thanks so much for reaching out! You might have to do a little research, but yes with an undergraduate degree you should be able to go into a master’s degree directly. You will likely have to complete some prerequisite classes (mostly sciences like biology and chemistry) and then you’ll be able to apply to master’s degree programs. I would research what master’s programs are available and then reach out to the directors and ask them their thoughts on the next steps you can take. Good luck! I have passed my graduation in CBZ chemistry botany zoology and now m Pershing in post graduation in food and nutrition ,can I give RD Exam . Hi there, thanks for reaching out. You will have to complete a degree in an approved nutrition and dietetics program first and then complete a dietetic internship. Check with the official dietetics organization in the country you are in and see what their requirements are to sit for the exam. Good luck! Hi Kristin it is a wonderful and useful page ,thanks for sharing your experience. I’m from India l have passed B.Sc. in Nutrition and Dietetics, M.Sc in Food Service Management and Dietetics and M.Phil in Food Science and Nutrition now pursuing Ph.D can i get a dietician job in U.S and am l eligible to write RDN there please enlighten me with information thank you.